Avid Indoor Golf | Rochester Golf | Golf Coupon | Go Golf U.S. Restrictions: VALID Tuesday - Friday 8am - 5pm. Rate you pay WITHOUT Go Golf U.S.
Don’t have our current year eBook for savings on golf? Click the button below and start saving TODAY with Go Golf U.S.! Avid Indoor Golf joined our golf discount service in 2018. They’re a part of Ridgemont Country Club, which is located right next door. This deal does have restrictions, so please pay attention to booking times. Users are able to play at Avid Indoor Golf for $34/hour (instead of $40/hour) Tuesday-Friday from 8am – 5pm. You should call for a tee time to let the shop staff know you are with Go Golf U.S. and make sure they’re not booked up. Or, you can head to the booking website here at Avid Indoor Golf Tee Times to reserve your spot. Save yourself $6/hour if you plan on teeing it up here and cover the some of the cost of the Rochester eBook for the year! AVID Indoor Golf & Fitness is western NY’s premier golf entertainment & training center! They’re open to the public! 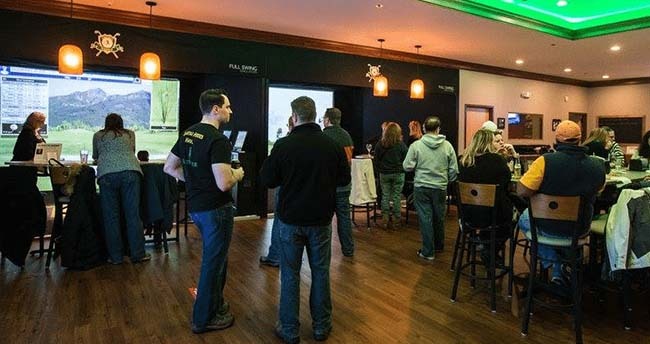 Bring your clubs to play on the best golf simulators in the full bar and grill. Located next door to Ridgemont Country Club in Greece, NY, they’re the place for golfers, athletes or anyone that wants to play golf and have fun! The weather is perfect every day of the year regardless of snow, wind or rain outside! Golfers are immersed in stunning 3D detailed realism during play. Over 90 world-famous golf courses are playable, with endless types of play. Individuals or groups can also practice driving, chipping or putting on the most accurate, state-of-the-art simulators around.